We were privileged to have Fiona with us to give a talk about how to produce paintings, in particular portraits, at the society. Even more to her credit was that she had recently broken her arm so could not paint, so she had prepared a tutorial like session with loads of colour prints. Asked if she needed to cancel, Fiona replied that she didn’t want to disappoint those attending by not turning up. She has gained my admiration for that. I will begin with a little from Fiona’s biography. She has impressive training in art and a good amount of experience as a practising artists and teacher. Fiona Bilbrough was born in 1967 and studied at the University of Melbourne, graduating with a Bachelor of Education in Fine Art in 1989. Fiona took a two year course with John Balmain in portrait and still life painting in 1988 and 1989. She received regular feedback from him until his death in January 2000. Fiona was an art teacher for multi-aged groups in oil painting at the McClelland Guild of Artists 1986-1995. From 1988 onwards Fiona was a contract Art teacher and Artist in Residence in a number of schools and from 1990 to the present Fiona has been giving private tuition for children and adults in her own studio. She teaches still life, portraiture, plaster casts and in open air painting utilising the Meldrum methods of casual observation. A special achievement for Fiona was receiving the Alice Bale Scholarship in 1995. This enabled her to study master paintings in Europe. Fiona is a member of the Victorian Artists Society and Melbourne Society of Women Painters and Sculptors. Winning numerous awards her work has also been published in the Australian Artists Magazine in 1996, 1997 and 2004. Fiona received the Victorian Artist of the Year Award in 2001, 2002 and 2003. She has work in private collections in France, Italy, Spain, England, Scotland and throughout Australia. With prints spread about the podium to quickly access, Fiona began by asking us why we paint. We love it, even if it’s a solitary activity at times, especially in the studio. Painting can absorb us, especially if it is something we love or possibly a tricky portrait to study. Painting from life means different situations all the time, so we get some variety. Painting gives us the challenge of trying to get things right, such as in the case of portraits, proportions, the human anatomy, the unique features of each sitter. Fiona says that she finds portraiture the most satisfying of all her subjects. Even though her preference is working from a live model, due to family commitments, Fiona has had to modify her work routine and methods. She now uses photographs more often, especially for practicing the parts of the human body that give her the most trouble. As she likes to go to the best for her inspiration and advice she has taken to going to art galleries that allow photography (without flash) and sketching on site. A good artist to look at is Sir John Campbell Longstaff (1861-1941), Australian artist, followed by maybe a couple of my favourites for lighting and mood, Tom Roberts, Vermeer and Rembrandt (I also like Sir Joshua Reynolds). Keep in mind the lighting in the room as you take your photos, the time of day and the type of lights will effect how accurately the colours come out in your photograph, as well as the fact that the photo may never match the painting exactly, making the colours either cooler or warmer than the original. This way she is able to take cropped photos of the details in some of our most prized paintings to enable her to practice from them. We have had lessons and tasks at TAFE from our drawing teacher which involved drawing over twenty noses, ears, eyes and mouths to help us with the same task. I noticed that focussing in on just the one detail from a human face and drawing it over and over from various references quickly gave an understanding of how to render them better. Have a look at the shape of the little part just above the lips and under the nose, the corner of the mouth and the shadow under the mouth as well as the angle or slope of the eyes. It is a practice, especially now that I have learnt this bit of advise from Fiona, that I hope to be able to expand to increase my own skills. Fiona mentioned that something that good judges in portrait exhibitions look for in paintings is the presence of hands that are well executed. Many artists shy away from hands as they find them too difficult. If you can learn to include them as a positive compositional part of your portrait it will help to raise it to a higher level. This again, involves a lot of practice. Now that we are on the subject of photographs I would like to go on with the pros and cons as Fiona described them. Photos can be a great resource when you can not get out of your studio, have little time or no model available. They can be the wrong colour as long as the tonal values are correct. A well framed face with a relaxed expression and good lighting can be a great resource. Black and white photos can even be a better picture to use than a colour one if the colours are confusing you as far as getting your tonal values correct. Balanced with working from a live model, photos can be a great help in practising your skills. Keep in mind that when you have a person sit for you, it is more tiring that you would expect. Regular breaks every twenty minutes are required and the session should not be too long, as the fatigue will come out in the face of the person as they get more tired and muscles start to ache. Looking at the work of masters will help in recognising the use of the medium and the brush. In the case of many impressionist style painters one stroke of the correct colour and tone does it. The paintings are not overworked and there is not a lot of tedious blending where not necessary. Knowing the right tone and colour BEFORE you take that stroke on the canvas shows the difference between a practised artist and someone who is still learning to master the medium or beginning. Another artist to watch out for in your practising is John Singer Sargent. His work shows how great artists interpret what they see and make it into art. They have their own rules to follow in applying paint to canvas for their own unique “look” and style. As a tonal painter these are five rules that are basically followed by tonalists that you may see in his work. When painting don’t be seduced by the colour or detail, we are often rushed into painting the details in a painting too early, keep the brush strokes broad as the details should only be the last five percent of your painting, even if time consuming in comparison. The use of a mirror, turning the work up side down to work on can help you stop the desire to get too fiddly too soon. It may also help in finding where you may be going off track. A black glass or “red guy” as I call them (a red piece of perspex) is also a good help if held up at 90° to your face over your eyes to reflect the painting. You will see it reversed and only in its tones. If portraits are still causing you a problem in oils, try changing mediums for a new try at them. I go from oils to pastels a lot just for this, apart from loving using both. Sometimes I can sort out a problem in one medium by tackling the same subject in another. It helps to zero in on where the problem is occurring, in the medium itself or in the subject. Getting back to the photographs, the main difference in painting from them rather than life is the way shadows are shown in many photos. They are black. If you look at shadows you will note that they are seldom this flat or lacking in colour. David Chen has told us that we should look at shadows as having FIVE parts to them, not just one flat colour. They can also be either warm or cool depending on the light source and reflective surfaces. The light areas in many photos also lose detail in a lot of cases. All these are important for you to either use or not, but at least see to be able to decide on. So check your lights and darks, and check your colours in isolation to others in the photo. Adjacent colours alter the way you perceive them. Just punch a hole in a piece of cardboard so you can look at the colour of what ever part of the photo you are painting to check you are matching the colour correctly (this can also be used when matching paint colour to that on a live model). On the subject of your models, look at the angles and tilt of the heads in many famous portraits. They are rarely straight on. Getting a good angle on the face can also make the painting or break it. A great tip from Fiona from this talk that I hadn’t noticed about some paintings, was looking at the use of the canvas. Instead of stretching the canvas at 90° with the weave in line with the frame, the canvas was stretched at 45° so that the paint was kept soft on the edges of forms by the way the brush reacted to the weave being on a different angle. As I sometimes have trouble with paintings looking a bit “stiff” or with too many edges, I really like this idea. As the human form is not a pile of lines and edges but form and shape, light and shadow, it would be good to try out this method of stretching a canvas to see how the brush reacts differently as I apply it. It may have broader applications than just portraits. Finally as we finished up, Fiona re-emphasised that photos are good for composition but nothing matches real life for matching skin tones. Portraiture is about picking up the individual features of a person, the face and the hands. When you decide to tackle one, look for the unique features of that person that you can translate into a painting and the ideas from the masters that have gone before us that made their works so timeless and amazing. Thanks Fiona for a great session. Some may wonder how you can give a demo and not paint, but you have passed on valuable information and were an engaging and enjoyable speaker. Our session today was about the Australian beach. Particularly taken from a photographic reference. The photo is just that – a reference. It is up to you as the artist to decide how you are going to interpret it to reflect your own style. What works as a photo doesn’t always translate to a great painting. Look at the values (tones). where are the darks, mid tones and lights? How many elements are in each and how do I translate these into tonal values and colour with paint? With a still life as you look at an apple for example, you will see ranges of tone from your highlights through you mid tones to the shadows and the reflected light in these, giving you a large range of tonal values to deal with. These values give your subject shape and perspective. A seascape is no different. Or even a portrait, if you look at Vermeer or Rembrandt you will se the use of tonal values to give the faces depth, form (or modelling) and perspective. Look for your tonal ranges in your subject, if they are not all there you need to start making decisions about where you are going to put them to make the painting work. Start your painting with all the large shapes and your darks and work towards smaller and lighter with your high key focal points and little marks to create texture in last. Keep in mind that you can be faithful to the general feel of a place without having to fill in every little detail, especially if your goal is a more impressionist style of painting. General things to think about is the sky doesn’t have to be just blue, try creating some drama with use of warmer colours to balance against the cools you will put into your sea. the sea doesn’t have to be all blue, tone down your blue with use of greens and nice tonal ranges with addition of white or another blue such as Tasman Blue which is a greener blue. Make sure that you “break” your lines so that the painting doesn’t look “stiff” or divide one part of the scene off from another restricting the flow of the eye around the work. Get the method right first when learning: Method is the decision making of looking at a reference and knowing how to spot the lights, darks, mids tonally and how you will translate these into paint. Your method is unique to you, how you decide to use methods of composition (rule of thirds for example versus other methods of dividing up a composition) makes your work unique to you. After this comes the technique. David emphasised the importance of drawing at this point. Going out and drawing sketches on site as well as taking photos is very important to the learning process. The real world changes all the time so you cant take all day to get a scene done, the light changes, things move, so you need to get quick impressions of a place. Doing drawings and quick oil, pastel or water colour sketches teaches your eye to take in information and process it efficiently and you get a feel for a place. You can then take this back to the studio with your photo reference to create a finished work. 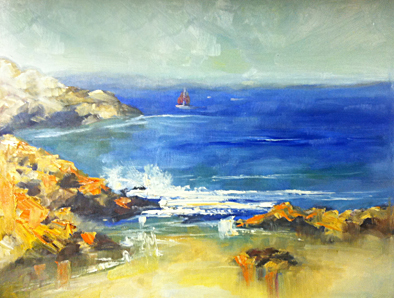 Try painting a seascape scene with a simple palette of colours such as Ultramarine Blue, Yellow Ochre, Lemon Yellow, Australian Red Gold, Tasman Blue, a mix of Cadmium Red and Yellow for an Orange and a mix of Permanent Crimson and Viridian for the very darkest darks in such things as rocks for example. As you work your way through the painting, at some stage stop using your reference photograph and make the painting your own by seeing it as a painting rather than a copy of a photo which may have a limited tonal range. During these exercises composition is not the main aim, I was totally unconcerned with creating a finished painting but learning the lesson of creating a loose and “fluid” seascape with broad strokes and little over blending. That does not mean that the aim of creating a painting that works is not on my mind at all as I like the balance and flow of my works to look correct. The shoreham painting needs the blue sea to be broken up with some greens and another blue but I am happy with the loose look of the crashing waves. The Seaford Painting is the one I did in the afternoon. There are a few strokes from David in this and the figures really do look better than I had them. I didn’t think the foreshore was working but David was happy with what I did there, as well as the sky. I may revisit this scene in another painting in the future and apply the techniques that I was shown in this one. David looked at all our works at the end of the day and showed us where our paintings could be improved. He put a few marks on one of my works to simplify the background and fixed my people as I only used large brushes on the day and they were in need of help. David said he liked my second painting more than the first. I did as well, considering that I don’t think I do my best work in the morning after a long drive. I plan to keep painting and drawing seascapes and modifying my style and methods as it is a subject that i enjoy doing as well as taking the time to go out and photograph for references. I just need to find some subjects that catch my eye. I have a few new references from photos taken in recent months so will need to have a look and make some plans. Philip was born in the United Kingdom and his family had a history in mining and farming (similar to my ancestors who came to Australia). He was sent off to boarding school as a child and I got the impression that he didn’t take to it. In 1976 as a 17 year old his family moved to Australia where Philip enrolled in a TOP year at RMIT. I understand what this course was as I participated in the same one at Caulfield in 1978, only I didn’t finish mine. Philip however, was a bit smarter and went on to complete his course and to study the Victorian College of the Arts, completing a 3 year diploma. Philip has been exhibiting since the 1980s both in group exhibitions and solos. He has called on his love of history and other cultures as well as history of his homeland and decoration and symmetry from ancient cultures and those of the middle and far east. His travels over the years have left him with a wealth of memories and mementos to use in his creation of ever changing series’ of artworks. The role of father, son, partner and artist have influenced his paintings and his interest in the grey areas of social issues and the world around him are used as inspiration for the sometimes very intricate and elaborate pen works that make up his most recent pieces. We were treated to seeing works in various mediums including sculptures and prints, showing Philip’s wide range of abilities. Subjects were sometimes humorous other times moving or thought provoking. Some were more realist, especially the oil paintings which is a shame that he no longer produces due to allergies to the paints. I think these were my favourites. Philip’s career is a great example of how artist’s can spread their wings to take on public art projects, even including the floral clock in Melbourne and a tram. He is still exhibiting and producing a huge amount of work as well as teaching. This is really inspirational stuff, it shows us that we can make a future for ourselves in the arts if we are willing to apply ourselves. Although I may not paint or draw like he does, I admire Philip for his dedication, skills, creativity and for the kind and approachable tutor that he is. He has been very encouraging and is a fantastic listener. He is also a prolific practising artist. He gave a professional and enjoyable presentation and it was a very interesting talk. For that I thank him. With our regular tutor away again today, we had a stand in tutor who presented a video that we had seen last year, but as with most things, especially when learning, a repeat visit is not a bad thing. I want to cover a few other issues that I have thought about concerning this artist’s life and art. One is his inability or lack of desire to have a plan for his work or indeed his life. A lonely childhood led to a life of not fitting in with structure of most types. His travels in search of that life and ability to produce to art he was wanting to produce was aimless to the viewer and I wonder if at least a loosely constructed plan would have at least led him to his best work earlier or not. Some things that did stand out were that his family’s money had to come to his aid when his adventures led him back to the UK, where he didn’t want to live after being shipped back their by Indonesia. The money of the tax payer had to save him from his raft trip in the Timor Sea. A trip that nearly killed him. Money from well meaning friends and their time and effort had to be brought in to give him a home that would protect him as age and ill health took over, as well as making sure he could stay on Bribie Island and not be evicted by the Council. Fairweather’s story has me at odds, as I understand the desire to opt out of the rat race that can be modern life that can overtake a creative mind. On the other hand my practical side says that for every decision we make, someone has to pay or be responsible. My business mind says that an arts practice needs to support itself, we need to work within the environment and the society we live in to make a living. Also, that if you fail to plan you plan to fail. Ian may be an exception, having been picked up by prestigious galleries and having successful sales even if he didn’t keep track of the income and paperwork involved in running a business. I think that this would be more difficult now that twenty years ago. For me, I feel that a practice based on this type of lifestyle would be an exception rather than a good rule to base my practice on. An exhibition of digital photographs which had been altered to convey a story or message of some sort. A few were attractive to look at others which were of a house burning were more confronting. Blood red cross and marks over a house created a scenario where you began to wonder what had gone on in the building. Sad or violent history, families and their stories were hinted at. Well done but didn’t hold my attention for a long time as I find paintings and artworks that have the marks of the artists evident such as paintings, drawings, sculptures etc more appealing. This was my favourite exhibition of the day. I went through it twice. The space was set up with items reflecting the story and the whole creative process was on show. Small sketches, coloured paintings, visual diaries, story boards and notes told how the finished products were planned and designed. Video interviews with the artist gave an insight into his process as well as the type of person he is. Mock ups of the finishes illustrated book were on display and at the end was the finished animated video. It was refreshing to see the gentler and kinder side of humanity in the story even though a little sad in spots. The video was beautifully done, the story was totally fictional but still very moving and had elements of the truth of our existence in it. Even though not my style at all, Rona gave a very interesting and informative chat about her process and the professional side of arts practices. She was totally engaging and I enjoyed listening to her story. She uses quality materials and makes sure that her finished product is up to a professional standard. Her interest in Egyptology, tatoos from various cultures and masks from all over the world was reflected in her work as her morphed creations of human animal used these themes to pull the viewer in to investigate what they were and what sort of personality they had. The addition of French wording she hoped gave the work an air of sophistication and further interest. As the work was of hand painted prints, she made some good suggestions about keeping colour swatches, keeping records of each project and records of the process of creation. She also spoke about networking and working with galleries. These works looked more like paintings by Dutch masters from the past. The colour palettes were rich but limited and muted giving moody feelings to all the works. Very atmospheric and creative they were good to look at eve though not my style. Although I could appreciate the skill involved in the creation of the works in this exhibition they didn’t really hold my attention for long. Some of the images reminded me of those by another artists at the McClelland Gallery earlier this year with a rather theatrical or even “Bollywood” feel to them. This is a very new gallery, the owner met us which was nice for a change, and we were “introduced” to all he works on display. The methods for producing pieces in this exhibition varied as did the style and subjects. They were all contemporary in one way or another, so whilst appreciating the skills involved, again they were not the type of art that holds my attention for long or that I connect with. This exhibition had prints by from our neighbouring country Fiji. The patterns and symbols reflected the culture and landscape of this lovely country. Some looked more like tattoo designs others like decoration you may find on fabrics. Having travelled through the Cook Islands I appreciated the beautiful patterns and inclusion of the animals and plant life that abounds in the Pacific islands. I posted a story about the demo Cathy did at the same venue last year at about the same month. The subject was the same but the materials were different. For this demonstration the materials were pastels and not oil paints. There are similarities in the way you build up both mediums. Usually it is from dark to light leaving your lightest tones until last. Cathy works just as well in both so we were in for a great demo. Just like her oil painting, the colours were mostly chosen in advance so in effect she had a palette selected. Cathy is a great believer in learning to draw well, as I am. The basis of every art form is the initial sketches, ideas and composing with drawings. Drawing helps you learn to observe and how to gain the very important hand eye coordination required for painting. There were a few questions about pastels and framing them as we began, so Cathy addressed these first. She has never had pastel drop in a frame and I have very little trouble with it as well. To keep your pastel from falling on to the matts you can wither get them framed with a small gap between the two or you can check the paper you are using, the way you are applying the pastel (it may be applied too thickly) or you may need to consider putting some glycene paper over the work and rolling it to press the pastel onto the surface so that it holds better. Some people give the whole thing a light spray with fixative, and I have done this as well. You just need to make sure you don’t use too much and keep it very light as you spray as it can alter the colours or ruin the pastel texture. As I have spoken about how Cathy builds up her paintings in the past, I want to focus on a few of her main and important points about drawing from this session. Especially important when painting portraits as the proportions of the face need to be observed to get the likeness. As little as a millimetre can make a likeness or completely miss it. Note the spacing between the centre of the eyes to the bottom of the nose to the middle of the mouth. Take note of where the ears are in relation to the eyes and nose. Measure across the face to see if the ears line up with the eyes and nose. Tone is Everything, Colour is Secondary. No matter what you are drawing make tone the most important thing. You can change your colours to anything as long as that colour is tonally correct. Tone will help model forms to give them depth and shape. Tone will help indicate light and shade. Be like a Carpenter. Measure Twice Draw Once. As you can not put wood back after it has been cut, those who work with it tend to measure a lot before cutting. To help in not having to erase, change, change again or redraw, try taking your time and measuring, then checking your measurements again before committing to a final line. Even though you are aiming for a likeness, remember that it is still an artwork. Background can be changed, colour and style of clothing can be altered, hairstyles cut and primped. The colours can be “shifted” to a warmer or cooler palette. You are the artist and depending on the arrangement with the subject, you may have the freedom to interpret as you see fit, or if not a commissioned piece, you may want to be very creative. Stand back and regularly check the progress of the drawing against the reference. Looking at your drawing form a few metres back gives you a better perspective. Take a break as you near the end of the drawing. Cathy puts aside her works and has a cup of tea or meal then comes back to them with a fresh eye. When you have given yourself time to clear your head and look at something else you will be amazed at how you can see things in your drawing that weren’t apparent before. The model for the photos that Cathy was working from was in the group for this demonstration and the likeness was very clear. Whether painting or drawing in pastel, Cathy creates painterly and identifiable portraits of her subjects. She is constantly working to improve her skills and pass on her knowledge to others. As always a very enjoyable demonstration. 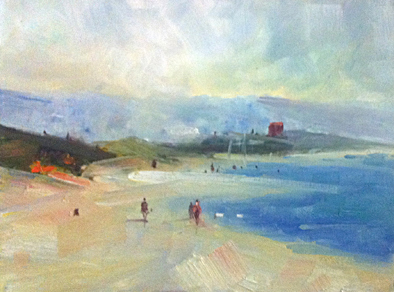 Cathy Van Ee is a teacher at the Peninsula Artists Society and does paintings by commission. Below are her contact details. We were to have a talk about art and the law, concentrating on intellectual property and copyright (which I was actually looking forward to as I think it is VERY important), however, the presenter called in sick and Bill, who seems to be the guy to fill in when things hit the fan, did so again with a well put together presentation covering most of his working career. Bill was educated at University in the arts and is a very well-travelled artist. Even with this he admits that his art is not always planned and he doesn’t always know where a project will end up when he starts it. His interests vary, but usually come back to the human condition. Starting with a very traditional slide show, we were treated to seeing works created by mixing oils with found materials culminating in three dimensional pieces that hung off walls or stood independently. Bill likes to use current events in the news as themes but has also calls on his love of ancient history and what he has seen on his travels through Europe, the USA and Australia. Bill’s work is mostly non-realist and playful. He will combine images from different perspectives to make narratives and will use any object to make a statement. This means he has often has a lot of bits and pieces lying around just in case he needs them. He says that you have to have more than you think you need when starting a project so that you can make creative decisions on the fly. He has been in several group and shared exhibitions over the years, some with our other tutor Phil, with whom he has had a long friendship. His constant and dedicated application of his arts practice comes out in the amount of work he was able to show us in this talk. Lots of experimenting, use of different mediums and materials as well as changes of style and method were shown from his busy career. How he fits in teaching is amazing. He is a very good example of someone who loves what they do and making it a passion and priority. Although I may not agree with his views about certain things, and I don’t paint like he does either, I admire Bill for his dedication and for the kind and approachable tutor that he is. He has thoughtful comments and suggestions and is a fantastic listener. He is also a prolific practising artist whose love of the arts is very obvious. He gave a professional and enjoyable (mostly) presentation and filled in at the last minute with a very interesting talk. For that I thank him. With our regular tutor away again today, we had a stand in tutor who presented a video that he said should be watched by all arts students before they finish their courses. In humour can be found a grain of truth. This movie, although very tongue in cheek and meant to be a satire of the life of someone convinced they are meant to be an artist, and his travels and troubles in trying to achieve his dream, can be a bit of a warning in the real world about entering the arts market for the first time. It should also be a lesson about what part of the market we want to be in and whether we want to keep our art as a hobby to enjoy rather than a stressful job we may have to endure. This poor guy, using the name Anthony Hancock is working in an office where everyone looks the same, everything is regimented to the tiniest degree and individuality is not accepted at all. His life to him is going nowhere and his hobby, kept secret from the landlady, has taken over his bedroom. One day he loses the plot and his boss suggests that he take some time off as he thinks he needs to pull himself together. Tony on the other hand, needs to take up the challenge of art. His landlady finds out what he has been doing and kicks him out so he packs up and goes to Paris to be an artist. There he thinks, he will be with likeminded people and will be able to express himself freely. I think he should have taken notice of the omen of his statue first losing its head on a bridge and then being dropped in the drink at the docks. In Paris he meets up with an artist and is invited to move in so they can share ideas and paint, and more importantly… pay the rent. By the mere fact that he seemed to be able to sprout a lot of incomprehensible dribble about art and his paintings, Tony is invited to more and more arts events and parties. He is suddenly “the guy” people want to listen to even though his flatmate is the one with all the talent. Finally in distress the flatmate leaves to go back to England, leaving his paintings to Tony to paint over or whatever he likes. At this point an art collector discovers him, or in reality his flatmate and he doesn’t tell him they are not his works as the collector thinks his paintings are rubbish. Tony is flung into fame, with an exhibition and people wanting his work (which is not his at all). All well and good until he is asked to do another lot of work for a show in the UK. Frantically he gets in touch with the flatmate to get some new paintings and set things right. He has been living in tony’s old residence and now has a steady job and only paints for fun. He however lets Tony have the work and the exhibition is set up. The only problem is that the collector hasn’t seen the paintings and neither has Tony. As i expected, the friend has now taken on Tony’s “style” of naive painting and Tony is nearly having a kitten. The collector however say how it is genius! Confusion reigns as Tony tries to understand how the same style can be done by someone else and it goes from rubbish to brilliant. He hands over his token gold watch, ring and bits and pieces from his earnings and tells everyone who the real artist is… and who has all the money… the collector/agent of course! So the movie ends up with him back in his little flat doing a new sculpture in his own naive style with the landlady as the model. Happy I think, that he has found his place with his art. Tony got away from a place where everyone looked the same and sounded the same to go to another place where everyone looked the same and sounded the same. What a joke as everyone in their little berets and all in black looked around in their garret in Paris saying how sad it was to be in a place where everyone looked the same! I have thought for many years about this as I have watched generations try so hard to be “different” and end up looking the same as each other. There’s a song about little boxes, little boxes all in a row and they all look just the same. I thought about this during the movie. We often try so hard to be different that we become a sort of parody or satire ourselves. We look for the right group, the right place, the right whatever. I have failed to fit into so many groups that I finally gave up on the whole idea. It is similar for the frantic search for fame and wealth, I worked so hard for a lot of years to end up gaining not a lot really except some interesting experience and a lot of lessons learnt. Now I do what I do because I love it, it is a challenge and the income and any notice I may get because of it will be a bi-product because I am working hard doing what I love to the best of my ability. The measure of my success will be with my own yardstick not someone else’s. Hopefully I will keep control over most of it and not be at the whim and will of too many people with their own agendas. Like I said earlier, a satire and a funny movie with some real life and current issues hidden in the plot.